The hostname and port that the web server is using will be listed in the /etc/httpd/conf/httpd.conf file. In this example, the hostname is www.example.com and the port is 80. In this example, navigating to www.example.com will cause the web server to server it's default document. If you need to configure HTTPD to listen for connections on a different port of than 80, in the /etc/httpd/conf/httpd.conf file, ensure you have the following configuration. In this example, port 12345 is used. Use your preferred IP address and port number. Also ensure the port number is not already associated with a service in the /etc/services file. Add the port number to the http_port_t context. Ensure the port number is in the http_port_t context. Update iptables to allow connections on port 12345. Restart iptables, and ensure iptables is active and running. 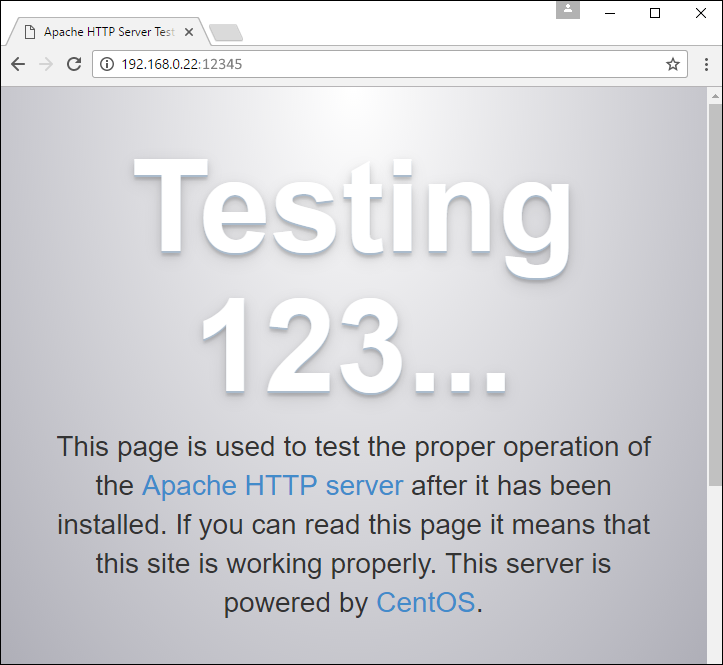 From a PC in the same subnet as the HTTPD web server, ensure you get the default HTTPD page when navigating to http://192.168.0.22:12345.